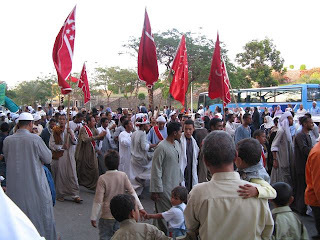 There was a parade for the Prophet Muhammad's birthday. Sufi Muslims celebrate Muhammad's birthday. Egyptians are mostly Sunni Muslims and they aren't supposed to, but the truth is that everyone loves a party. There was a fair as well but I wasn't able to see much of it. My friends were worried that there would be too many police at the fair. Actually some of them almost got arrested for being unlicensed tour guides as it was.